Performing at Lucy's Kid's Charity Concert tomorrow! Come see what a Guitar Center Studios Rock Show class can turn into. Very excited to see them play. Hello, this is Luca L. I am a volunteer from Lucy's Kids Charity Concert, and I’m interviewing the band Alone Together. I have some questions that I’d like to ask the band. What is each band members name, and what instrument do they play? The band idea started when two brothers, Levko & Lys performed with drums and guitar at their after school RockStar class while at Marquez Elementary. 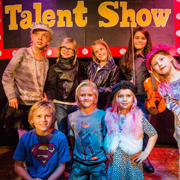 Back in Topanga, siblings Paria and Wiley performed at their school’s RockStar program. 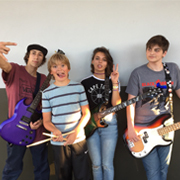 When both boys went back to Topanga Elementary, all 4 friends got together at another Rock Star class and included Kalyna, who sang their original song Coyotes of Topanga at the Avalon, in January 2015. All the band friends have lived or gone to school in Topanga, and have grown up watching bold coyotes frolic all over the canyon. The Brothers Gage - Alex and Brody, both started playing harmonica when they were 5 years old. Within the next few years, they began singing, playing guitar, bass, drums, and keyboards. 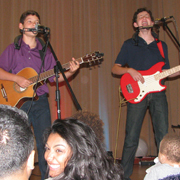 They performed for the first time at a local Topanga talent show in Oct. 2013. Brody was then 8 years old and played harmonica while his brother Alex was 10 who sang and played guitar while they performed the song "Wagon Wheel". They've now played at the same talent show 4 times, at charity benefits, and have played at McCabes Guitar Shop in Santa Monica for miscellaneous events and shows. 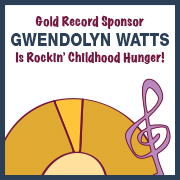 Gwendolyn Watts is Golden! You've busted the charts with your gold record contribution. Thanks for rockin' childhood hunger!